General Information: We have been given the opportunity to offer a 25 pound sack of sustainably grown, mixed colored carrots. This is not your average garden variety of yellow, orange and a pink-like carrot in washed-out colors. This is a vibrant combination of hybrids and heirlooms, grown for color, flavor and exceptional vigor - carrots that taste like a carrot should, offering a sweet juice, a firm crunch and lots of vitamins and fiber. 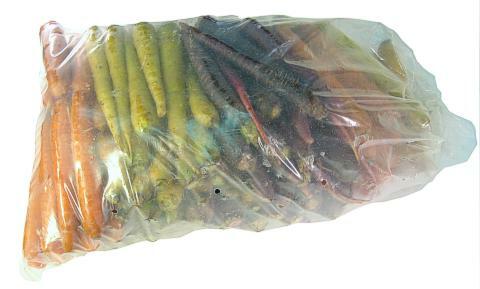 The mixed color sack will contain combinations of Black Knight, Nantes, Yellowstone and White Satin carrots, grown by a passionate southern California farmer who has dedicated his pursuit to flavor and innovation. Available through the winter to offer your customers a colorful alternative to the standard root vegetable, be sure to sample the stellar flavor for yourself. Each variety has been developed to maintain color through all cooking processes and will provide a beautiful array of color on a winter plate. Enjoy!